Get the Scandalous Women widget and many other great free widgets at Widgetbox! The American author, a former journalist and Middle East correspondent, is living la vie Parisienne while writing a book. Entries categorized "Vita & Zelda Party"
Late one night I stumbled on several videos of people putting on make-up ala 1920s style. Looks like fun I thought. Besides, how hard could it be? So there I was, suddenly, as if I'd lost all my marbles, putting on loads of make-up during the midnight hour. We have the worst lighting in this house. I took a few pictures with my Mac, the light on in the kitchen with the kitchen door swung wide open. Yeah, I must admit that I touched up a few wrinkles here and there. Call me vain. I'm mid-40s, soon to have another birthday, and majorly self conscious about my mug these days. I'm feeling like a 13 year old over again. Oh do I feel awkward sometimes. How do I dress? What to wear? My body is changing. That dress is too short. Jeans don't fit but I'm not ready for elastic waistbands. That shirt is too young. That blouse is too matronly. I'm too short and getting shorter. Anyone out there hear me knocking? The choice to put these two photos up is freeing in a way. Little sis will be shocked. Camellia Petunia is 3 years younger and more likely to show her face on line. Then again Little Sis didn't jog on the beach year after year. Or follow the dolphins from the shore watching them bodysurf day after day. Or live in Las Vegas. Or walk all over the French countryside. Actions all performed sans sunscreen like a big dummy. Well I didn't quite achieve the look that I was after. My eye make-up is not dark enough and neither are my lips. I'll be giving this another try soon and I promise to share. Although I most likely won't be sharing my wrinkles. Tags: "1920s face", "flapper face", "mid-40s", 1920s make up"
A Fanciful Twist Party Part 2. Vita's Turn to Shine. What Sisters are Good For. We're back. Now it's Vita's turn to shine. She insisted in posing in all her party finery next to this blue Eiffel Tower. I tried to tell her that it made her look a bit stiff but she would not do with without it. It reminded her of smoke filled rooms and travels long ago. Back when they passed out free boudoir dolls to the ladies at the clubs in Paris. And to think that when people first meet Vita they think that she is a shy one. More like "sly" one. If they only knew! Ah, such tales I could tell. She would never forgive me if I did. It wasn't long before Vita and Zelda wanted to pose together. In my earlier post I mentioned that Vita had gotten carried away with the desserts. The ladyfingers to be exact. Well, sad to say but Zelda took leave of her senses with the champagne. These are the types of situations when you are thankful for a sisterly shoulder to lean on. And speaking of best buds, note how Pop is gazing up fondly at Zelda? Maybe he's had a little too much bubbly too. I just noticed that Zelda is appearing a little wistful here. I wonder what she is thinking? I'll have to go check on her in a moment. I hope that everyone had a wonderful time today. Alas, I have not a chance to join any of the parties myself. Probably won't get a chance till tomorrow. Such torture. for being such spectacular hostess! 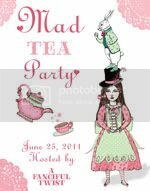 Tags: "A Fanciful Twist Mad Tea Party", "bed doll", "boudoir dolls", "Fancifal Twist party"
Finally. Time for a little party. Welcome! A Fanciful Twist-0-Fun! Goodness! What a morning! We found out last minute that we will be having unexpected house guests in a few hours. Instead of endless hours of party hopping, it's been all vacuuming and "Do we have enough clean sheets?" Zelda was the first to get herself all dolled up. The woman goes to bed with her make-up on so all she really had to do was jump into her party duds. Boy, this girl likes to pose! We're not entirely happy with the way her crown and mask turned out but we were all in such a hurry this morning. Whatever you do, don't tell her that the mask makes reminds you of Batman. She's liable to get nasty. Here she is posing with her crown on. Whatever else you do, don't tell her that the star hanging over her eye reminds you of a pirate. I thought Zelda was hilarious for saying so. She doesn't think that we're funny. So many things that we should refrain from saying. So many things that we go ahead and say anyway! "Pop" (short for Popcorn) the elephant is waiting patiently at her side while she's so busy being photographed. Zelda is halfway through the ladyfingers already anyways. I wonder where his misfit elephants pals are? Of course they were all invited. Maybe they're coming along with Zel. Sometimes I catch Pop gazing up at Vita with such a sweet look on his face. Reminds me of my puppies. Vita and Pop are crazy about one another. Best friends really. The three of us were exploring an antique mall that is going out of business the other day. Just in time for the party, we discovered 3 of these lovely vintage paper lanterns. This was hanging in my craft room but we moved it into the living room for the festivities! We started to add a few embellishments but sigh...that was just about the same time that we learned about the house guests. It will probably have to come down before we ever get the chance to do it up the way we really wanted to. Well that's all for now. We really must go see what is keeping Zelda. We'lll shine the spotlight on her a little later, so do come back again and see! Share, discover Steampunk books on new FB Page. 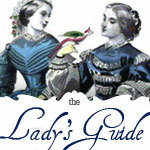 Victorian Station-Victorian decorating ideas and information about the victorian era. Bookish Dame Goes Steampunk: New Steampunk Genre Split??? Bustlepunk!!! Art, Movies, Wood and what not . . .